We’re delighted to be working with Ari Roar for the first time! Ari Roar – moniker of Texan singer-songwriter Caleb Campbell– will release his debut album, Calm Down on 25 May via Bella Union. Today Ari reveals the album’s title track and lead single, wherein he explores the push-pull of anxiety through an agitated rhythm and dreamy vocals. With intuitive powers of clarity and concision to the fore, Calm Down is an album that draws on 1960s pop and modern DIY heroes for a set of lovingly languid, lo-fi miniatures. Depths of detail and lived experience bustle beneath effortlessly melodic surfaces; sure signs of a writer in confident command of his pitch. With a tight run-time of 28 minutes and few of its 15 songs breaching the two-minute mark, Calm Down is not an album that overstates its case. Called In merges the influences of garage-pop and Grandaddy in its plaintive plea to ‘stay alert’, while the brightly summery Windowsill and literal shaggy-dog tale Lost and Found show an easy lightness of narrative touch and mood control. 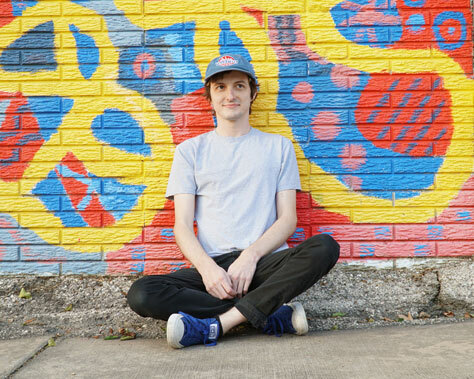 Elsewhere, Ari makes weightless work of variously playful, psychedelic material, navigating his songs with expressive ease even when he’s documenting difficulties navigating high-school hallways on Don’t Have a Fit. Off and On is luminous, Implode sweetly chugging. Sock Drawer recounts an inner voyage with a gently psychedelic touch, before the playful strut of Choke and buoyant release of Lucky One offer precision-judged notes of climactic uplift. Local support comes from Wyoming. Wyoming is a synth pop outfit originating from Manchester/Cologne that conceptualises catchy synthesiser landscapes and complex yet moving rhythms. It glimmers at every turn guided by androgynous pop vocal lines. There are songs so delicate, they are as if resting upon a floating cloud. There are songs so splitting and tremulous, they are as if charged with electricity and then placed under water.Wyoming has proven time and time again, being their successful concert at the Melt!–Festival, or as supporting act on tour with ChkChkChk as well as for Glass Animals, that this magnificent journey that they take us on not only succeeds on vinyl but also on stage.